David received a Bachelor's degree in wildlife biology from Colorado State University (1987). He studied bear nutrition for his Master's degree at Washington State University (1989) and ruffed grouse nutrition and ecology at Virginia Tech for his Ph.D. (1994). He lectured at Humboldt State University and held a post-doctoral research position at Utah State University before joining the Caesar Kleberg Wildlife Research Institute. 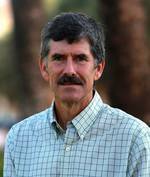 His primary interests include wildlife ecology, nutrition and physiology, and he has worked with several species, including bears, galliforms, and ungulates. David is married to Liisa and has 2 wonderful kids, Nicole and Matt. Large Mammal Ecology, Texas A&M University - Kingsville. Graduate level. Wildlife Nutrition. Texas A&M University - Kingsville. Graduate level. Big Game Management. Texas A&M University - Kingsville. Senior level. Ecology and Management of Upland Gamebirds. Texas A&M University - Kingsville. Graduate level, and Humboldt State University. Senior level. 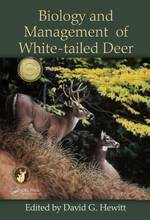 Principles of Wildlife Management. Humboldt State University. Senior level. Principles of Wildlife Ecology Humboldt State University. Junior level, non major. Ecology and Management of Upland Habitats. Humboldt State University. Senior level. Senior Seminar. Humboldt State University. Senior level. Micro-computer Use in Natural Resources. Virginia Tech. Sophomore level. Organizes and presents information on the most studies large mammal species in the world. The book covers the evolutionary history of the species, its anatomy, physiology, and nutrition, population dynamics, and ecology across its vast range (from central Canada through northern South America). Applying emerging ecological theory for the advancement of wildlife management, Wildlife Science. 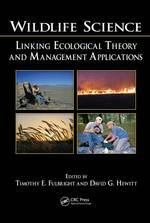 Linking Ecological Theory and Management Applications provides a long awaited cooperative look at the future of ecosystem management.